Now what are these Martha Washington Chocolates, huh? They are hand dipped chocolates. They are perfect for the holidays. These are such a favorite of mine. My mom use to make these chocolates every year for the holidays when I was younger. Oh how I love them so much with that coconut sugary chocolate flavor. As I got older and didn’t live at home I’d still ask her to make them. Then over time she wasn’t able to make them any more and it saddened me but I had great memories of them. One of my biggest memories is after she make coconut balls the next day she would set up everything in the living room on a table with and dip in chocolate as she watched her favorite soap, Days of our Lives. Now that wasn’t soap to miss even making chocolates. Such good memories! Since all that I’ve learned to make them myself. It was a little tricky at first learning to do this on my own. I’d never made them before or any other candies like these. Once I got the hang of it making the balls the dipping process seemed to go pretty smooth. It’s not that hard a recipe but it is a bit time consuming. You make the balls then put in the freezer overnight. Then next day you make the chocolate to dip them. Every time I make them it brings back memories with Mom. MAKING THE BALLS: Mix milk, butter, powder sugar, coconut and vanilla in a large mixing bowl. Chill mixture for a few hours or so in the refrigerator. Then take out to shape into balls. Put them in a cake pan or on baking sheet to harden in the freezer overnight to get them ready for dipping into chocolate. MAKING THE CHOCOLATE: Use the top of double boiler to melt chocolate chips and paraffin wax until smooth. Prepare a cookie sheet by lining it with wax paper. 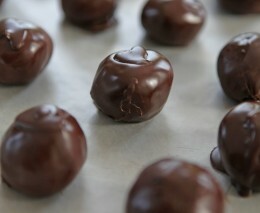 Dip each ball in the chocolate mixture with a toothpick or candy dipping tool. Put on lined cookie sheet. They will harden very shortly after doing so because of the wax in the chocolate. When hardened put them into containers and keep in freezer. Of course keep a few out for eating right away. Take them out when ready to eat. Let them sit a bit to soften. Then enjoy! Paraffin wax is a white, odorless, tasteless waxy solid. It has different uses. One of them is making candies with. It is edible but said to be non-digestive. My guess with non-digestive is if you eat a lot of it at one time. I myself have never had any trouble with that. It is melted into the chocolate so you can’t taste any wax. When using this for dipping chocolates you’ll want to keep the pace up since it dries and sets quickly. I appreciate all types of chocolates recipes and I been a chief in the kitchen for years and I used to own my own Restaurant and now when I have the extra energy, I make yummy desert.